Kroger (NYSE: KR) is one of the world’s largest food retailers and has a long history of paying dividends. But many investors ask: is Kroger’s dividend safe going forward? To answer this, let’s look at the business and Kroger’s dividend trends. One area where Kroger is focusing is ESG investing. The business is improving its supply chain while trying to minimize waste. Minimizing waste often costs more up front, but it can help the business in the long term. Kroger paid investors $0.18 dividend per share a decade ago. But since then, the Kroger dividend has climbed to $0.49. That’s a 172% increase! The compound annual growth is 10.5% over 10 years… but over the last year, the dividend climbed 5.4%. The slowdown in dividend growth isn’t a good indicator. However, Kroger still might be a good income investment. Let’s look at the dividend yield. The dividend yield comes in at 1.77%, which is close to the 10-year average of 1.82%. The chart below shows the dividend yield over the last 10 years. 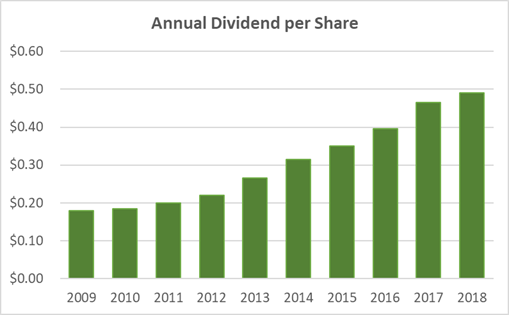 Less than a 2% dividend isn’t great, but it’s around Kroger’s average. 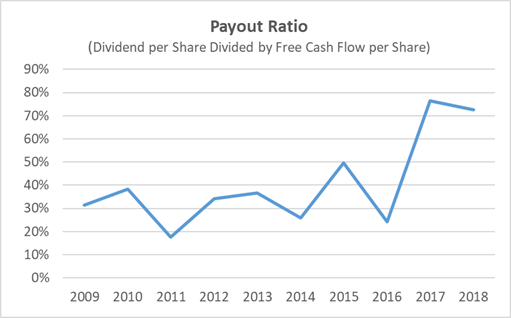 Let’s look at the dividend payout ratio. Many investors look at payout ratio to determine dividend safety. Payout ratio is calculated by taking the dividend per share divided by the net income per share. So a payout ratio of 60% would mean that for every $1 Kroger earns, it pays investors $0.60. Payout ratio is a good indicator of dividend safety… but accountants can manipulate net income. They adjust for goodwill and other non-cash items. A better metric is free cash flow. Here’s Kroger payout ratio based on free cash flow over the last 10 years. The ratio is volatile over the last 10 years, and the trend is up. The last reported year shows a payout ratio of 72.6%. This doesn’t give much wiggle room for Kroger’s board of directors to raise the dividend. 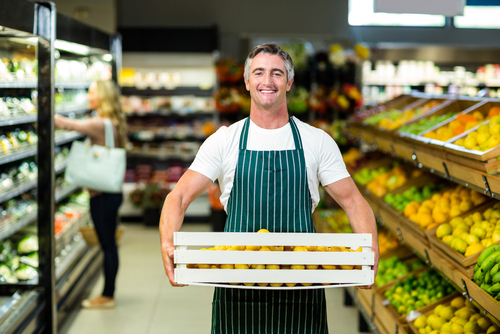 Kroger is a giant in the food retailer space. This provides some protection against downturns, and steady cash flows also help. 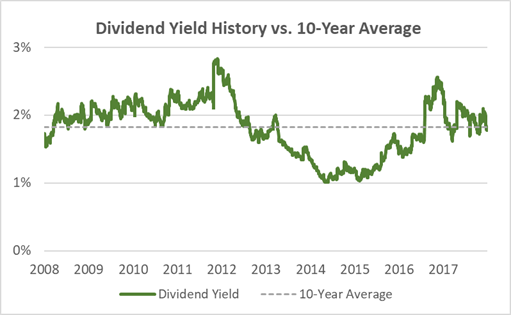 However, the dividend yield isn’t very high and the payout ratio trend is concerning. You might want to shop for better dividend stocks in the current market.